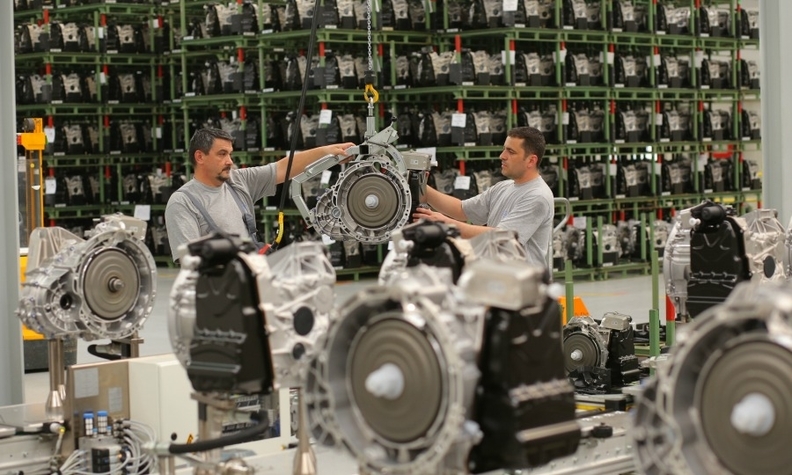 Workers assemble transmissions at Mercedes' plant in Sebes, Romania. FRANKFURT (Bloomberg) -- Daimler is expanding its transmission plant in Sebes, Romania, as the manufacturer ramps up its component supply to meet rising demand for its Mercedes-Benz cars and SUVs. The automaker said today it had set a new company record for global sales in a single month as its March volume rose 13 percent to 158,523 vehicles. Demand was driven by the E class and Mercedes' growing lineup of compacts. Daimler is spending more than 300 million euros ($411 million) to add production of a new nine-speed automatic transmission in Romania in 2016, the company said today in a statement. Mercedes, the world's third-biggest producer of premium cars, has also posted sales jumps exceeding 10 percent for nine consecutive months as demand in China and the United States drive deliveries. The automaker has added shifts at car factories and its transmission plant in Stuttgart's Untertuerkheim district was among sites that shortened year-end holidays in 2013. "The additional assembly capacities in Sebes supplement our production operations at the Mercedes-Benz Untertuerkheim plant optimally," Markus Schaefer, head of production, said in today's statement. "They also are an important contributing factor in the economics and the flexibility of our international production network." Daimler CEO Dieter Zetsche is pushing for Mercedes to beat BMW and No. 2 Audi in global deliveries by 2020, retaking the industry lead it lost to the BMW brand in 2005. Mercedes is adding capacity outside its home market in part to limit spending on production and distribution. Daimler opened its first plant for passenger-car engines outside Germany in Beijing in November to supply its factories in the world's biggest car market. Mercedes production in China will double to more than 200,000 vehicles annually by 2015, Daimler said a week ago. Hourly labor costs in Romania are about a tenth of the figure in Germany, according to the VDA German auto-manufacturers' association. Mercedes is scheduled to open a plant in Brazil by 2016 to make the mid-sized C class and compact GLA SUV for the local market, and it's considering production in Russia. The plant in Brazil complements an 800 million euro factory in Kecskemet, Hungary, that opened two years ago and builds the B class and the CLA coupe-like compact. The Hungarian site is adding work shifts in May. Daimler, which has been producing parts for engines and transmissions in Romania at a joint venture since 2001, will add about 500 jobs to the existing 1,200 posts, the company said. The expansion includes training sessions for Romanian employees by counterparts based in Untertuerkheim.